There are times when a company puts out a kit or in this case, a set of figures, where one thinks "Why hasn't someone done this before?". 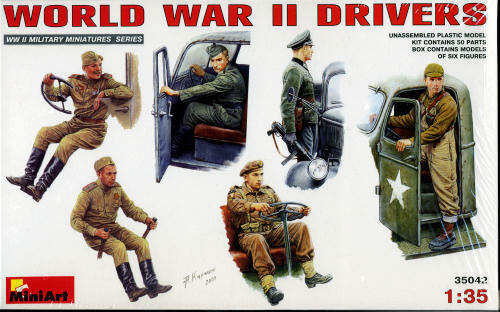 MiniArt's most recent set includes drivers of various nationalities, most of them posed seated, but a couple are shown either stepping into the cab or standing on the running board of a vehicle. Of course, these figures cover a variety of nationalities. There are two Russians, a pair of Germans, a British and one American. I am going to guess that none of these is from any other set as the poses appear to be unique to this particular boxing. Typically, the painting and construction guide is on the back of the box. Painting information is provided for a number of different paint makers so finding something that is available in your locale should be simple.